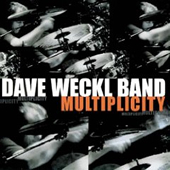 Multiplicity was the band's fifth album and the ninth overall for Weckl as a solo artist. The record features a diverse lineup of nine songs that highlights the writing talents of Weingart, Meek and Weckl, who spent many hours together in Weckl's studio composing most of the material. But the performance talents of all the band members shine through on this album. "I'm very excited about this CD," Weckl said. "I had much more involvement in the writing process than on Perpetual Motion so it was very gratifying. With the inclusion of percussion (Richie Garcia) and rhythm guitar (Paul Pesco), there is a lot going on with different textures and sounds." Bassist Ric Fierabracci, who played with the Chick Corea Elektric Band for many of its 2005 shows, also appears on the record, complementing long-time DWB bassist Tom Kennedy. 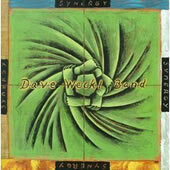 Says Dave about this album, "A live CD is like no other recording......it is the moment, it is everyone playing, conversing, thinking, expressing and communicating to an audience and feeling their response. 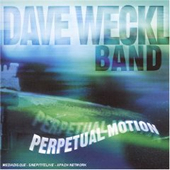 Released in 2002, this record featured Steve Weingart (keys), Tom Kennedy (bass) and Brandon Fields (saxes), plus a horn section consisting of Jerry Hey and Gary Grant on trumpets, and Bill Reichenbach on trombone. There were also vocal melodies and backgrounds being by Hussain Jiffry, Sanjay Divecha, and Dave's daughter Claire, who was five-years-old at the time. Of his daughter singing on her first record, Dave said "she did a pretty good job if I do say so myself!" The Zone is special 2-disc package with a combination of music and instructional videos. Disc One is an audio CD compilation of some of the best tracks from Dave's three acclaimed Stretch Records recordings, and features two tracks previously released only in Japan. Disc Two is a DVD video sampler containing highlights from Dave's three instructional videos available from Carl Fischer, in which Dave provides insights into how to play effortlessly and organically (or "in the zone"), how to develop technique, how to practice, and how to develop your sound. Together, this audio CD and video DVD special package is an indispensable source of musical inspiration and valuable information for all drummers and drum aficionados! 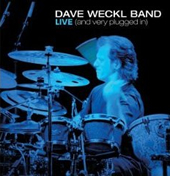 FEATURING: Dave Weckl - drums & percussion, Tom Kennedy - electric bass, Brandon Fields - tenor & soprano sax, alto flute, and Steve Weingart - keyboards. 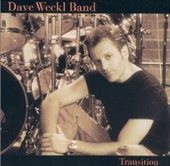 Transition was the first recording of the band after Jay Oliver and Buzz Feiten left to pursue other music projects. As the name implies, it represents a time when the look and feel of the band was changing - with new faces, new ideas, and a new sound. Steve Weingart, who took over on keyboards, wrote most of the material together with Dave. For the most part, this record was recorded live in the studio. Transition also saw some changes for Dave in terms of his personal setup. This was the first record where Dave utilized Remo percussion products on the left side of his kit. Check out "Amanecer," where Dave uses creative sticking to produce world percussion textures that enhance the dark and mysterious feel of the song. Synergy was a real group effort, with most of the material written from raw jams that were later transcribed and finished in the studio. Individual efforts by Buzz Feiten (guitar) and Brandon Fields (sax) rounded out the CD, with a couple of songs also being written by Jay Oliver (keys) and Dave. One of the only real guitar feature CDs Dave has made, Buzz really shines on this recording. "He's one of the greatest," Dave says. 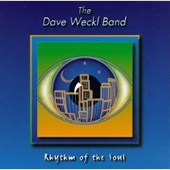 Rhythm of the Soul was the first effort by Dave and longtime collaborator Jay Oliver (keys) to put a band together, write all the music with the band in mind, and tour. It was a big step for Dave - to dive into the "leader" role, and to assemble a band that would go out and tour. This record saw the introduction of Buzz Feiten to Dave's work, with saxophone work by both Bob Malach (NY) and Steve Tavaglione (LA). It also saw the introduction of a different vibe in Dave's music - with an R&B groove-oriented feel. It was a big seller and remains a fan-favorite. It also was an introduction to digital recording and editing, using beta versions of Logic and Digital Performer (Dave now uses Pro Tools).